None of these are up on the site yet (so email me if you want one of them), but they might be soon if I don't spin them first! 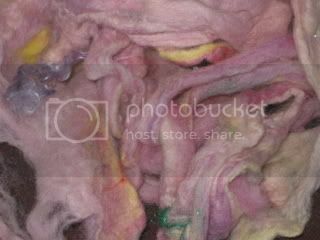 Felted fibers to make in to nubs for spun yarn. Super sparkly and squisky. Looks like a sea monster! 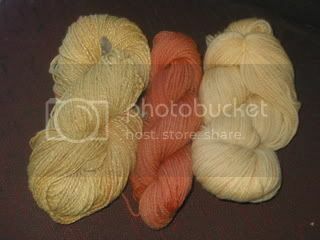 Naturally dyed yarn. Silk and wool dyed with pomegranate and fustic, light touches of red. 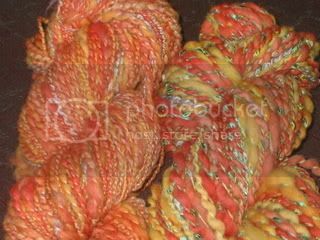 Sock yarn dyed with onion skins and madder with a touch of fustic. 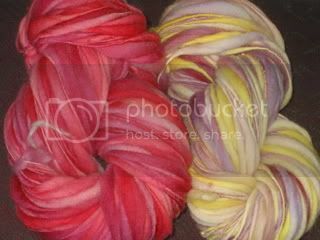 Sock yarn dyed with just onion skins. Naturally dyed and slightly felted. 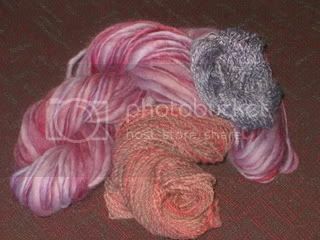 Plied, blended, and the usual works. Not naturally dyed, but super bright (and good yardage). I want a baby surprise in the yellow, but alas it is bulky. Blue is naturally dyed silk, others chemically and are wool. Smaller skein is fulkled lsightly to make it puffy!